While the dangers of too much sitting are being discussed everywhere, we’ve also been told that even a daily hour at the gym (if we can get there) isn’t enough to counteract a whole day in the chair. So what’s an office body to do? Luckily there are strength and stretching exercises you can do right at your desk to ease back strain and improve overall wellness — at least until your height-adjustable desk arrives. Heck, it may even be an opportunity for team-building! The folks at AllBusiness have explained 7 moves to keep your body limber — including neck rolls, arm extensions, and back stretches — so read the full article here and start a regular habit of movement. 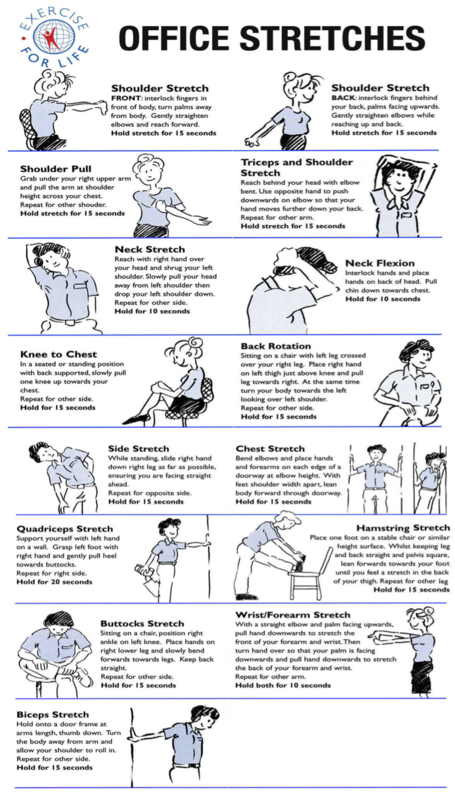 Set stretch-break reminders for yourself at 1 or 2-hour intervals, or post handy graphics in your office as a visual reminder. Source Langley also has alternatives to standard office seating to get you out of the chair rut. The Bello Stool, the Evolution Ball Chair, and the Perch Chair all offer great ergonomic options that give your back new ways to move. Making your health a priority will pay off in the long run, enabling you to stay active when it’s time to retire to full-time fun! Source Office Furnishings — Making Your Office Work Better!